The second floor Green Library display cases currently showcase 1,800 years of history on one of the Caribbean’s most misunderstood islands. “Haiti: An Island Luminous” also shows what one FIU student can create with the right motivation. The exhibit, on display until Feb. 28 and permanently available online, is the creation of doctoral candidate Adam Silvia MA ’09 and FIU’s Digital Library of the Caribbean director Brooke Wooldridge MA ’07. They wanted to construct a complete and functional database of Haitian history. In 2009, Silvia – who is writing his dissertation on Haiti – came to Wooldridge with a problem. 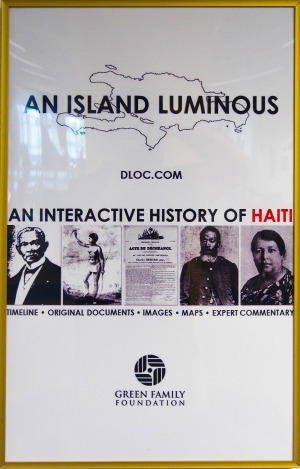 FIU’s Digital Library of the Caribbean was overflowing with information on Haiti, but needed context to be understood. She initially challenged him to provide 40 PowerPoint slides of context, but Silvia realized that 40 slides would not be enough. So he came up with a different approach. “The task was to take raw archival content and present it in a way that you do not have to be a historian to approach, interpret and understand it,” Silvia said. The final product is a chronological tale of Haiti from its indigenous beginnings to the devastating earthquake of 2010. With support from the University of Florida, Latin American and Caribbean Center and a $20,000 grant from the Green Family Foundation, he attended conferences and gathered the commentary necessary to build an exhibit that offered not just historical information, but a learning/teaching tool useable for decades. “‘An Island Luminous’ was workshopped at numerous academic conferences as it was developed, which provided us with an opportunity not only to improve the site, but also to ask scholars to participate.” Silvia said. Silvia curated the physical exhibit that includes copies of rare books, manuscripts, newspapers and photos from more than 100 different contributors. Each piece is accompanied by cited sources and commentary. “I hope that the exhibit of physical objects and materials serves to peek curiosity and encourage people to visit the incredible online project,” said Dean of FIU Libraries Anne Prestamo. The exhibit has already proved useful for the Haitian Summer Institute, an FIU program that immerses students in Haitian culture, and it will be on full display for the institute this summer. Silvia wants the next phase of the project to be its incorporation into high school and university curricula in the United States and, with assistance from the State University of Haiti, he and Wooldridge are lobbying for its use by Haitian schools and various non-governmental organizations as well. The two also hope those who are pursuing independent studies or simply want an introduction into Haitian history can easily use it to enhance their knowledge. The new exhibit is also likely to increase viewership of the online library, which already garners more than 1 million page views per month. This is a unique idea to generate this permanent exhibit. The site will be a great resource for anyone who would like to learn about Haiti and who were misinformed about Haitian history. It is certainly encouraging to see that all these materials are available online for a better historical understand of this great nation’s history that has not been talked about enough. It is a wonderful job your on line “share knowledge to the world.” I am confident that many students and our community will thank you.